This weekend marked the grand opening of Forever 21 clothing stores inside former Gottschalks/Harris' buildings at Riverside Plaza and Hemet Valley Mall. The stores are part of the Los Angeles-based retailer's aggressive growth plans that includes new large-format stores, many of which are currently taking up residence within former Mervyn's and Gottschalks stores. In excess of 50,000 sq. 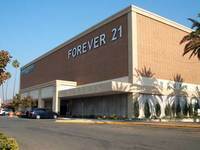 ft. -- well above the majority of the chain's existing mall stores, most of which are under 10,000 sq. ft. -- these larger stores will include a wide-ranging mix of clothing and accessories for both men, women and youth. More recently, the chain began opening 20,000 sq. ft. stores, including a location at The Shoppes at Chino Hills. Initially, the Riverside location will take up 90,000 sq. 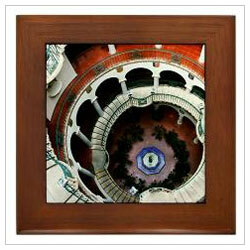 ft. on two levels of the 204,000 sq. ft., 3-story store, which opened in 1957 as Harris'. Future plans call for possible expansion into some of the third floor, likely making it one of the largest stores in the chain. What will eventually become of the unused portions of the building -- including a basement -- remain unknown. 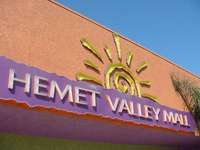 Earlier this year, the chain opened a large-format store in a former Mervyn's store in Victorville. A fourth Inland Southern California store is expected to open later this fall inside a former 3-story, Macy's/Broadway department store at Inland Center mall in San Bernardino. Once fully occupied, it will likely rival the Riverside location in eventual size. It'll be interesting to watch how these new large-format stores evolve -- and perform -- for the mostly youth-oriented clothing chain. At the very least, the re-using of the former Gottschalks/Harris' (Riverside) and Macy's/Broadway (San Bernardino) have forestalled any potential demolition of the mid-century department store buildings. On the heels of the worst holiday shopping season since 1969, the nation's retail landscape is likely headed for moderate changes as weak and battered retailers file for bankruptcy protection, close stores and/or shut down entirely. 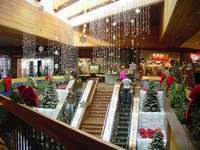 The transformation could see shoppers, both nationally and locally, greeted in the coming months with more than a few empty storefronts lining the halls and pathways of their favorite malls and shopping centers. Thus far, former retail giants Circuit City, Mervyn's and KB Toys have each announced full closures, while regional department store Gottschalks recently filed for bankruptcy protection. Though the closures of the former have affected nearly every mall nationwide, Gottschalks -- if forced to close -- could spell additional trouble locally as the Fresno-based retailer has anchor stores at 7 area malls. (It could also bring a final end to a local retail empire that began in 1905 as The Harris Company). Another potentially large impact locally is whether national mall owners will shed some or all local malls as they struggle under the weight of debt during a very tight credit market. With the possibility of reorganization on the horizon, Chicago-based General Growth Properties -- owner of four local malls, including three of the region's largest -- in particular could add additional stress to the local retail scene. 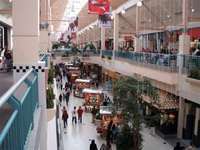 So, where does this recent -- and potentially future -- turbulence leave local malls? Let's take a closer look at each. For all intents and purposes, this mall is already dead. 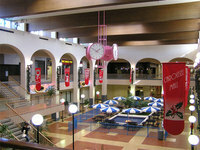 Opened with great fanfare as Central City Mall in 1972, the 37-year-old, Victor Gruen-designed center began its decline in the mid-1990s, not long after being rechristened as the Carousel Mall. In 2000, the flagship Harris' department store closed (it had opened independently in 1927). The remaining anchors, Montgomery Ward and JCPenney departed soon thereafter (2002 and 2003 respectively). Although a planned mixed-use redevelopment has stalled, it's not likely the few remaining stores will survive the current retail environment. Tiny by mall standards, the Redlands Mall is likely to be the next area mall to fall -- particularly if General Growth Properties reorganizes and/or Gottschalks closes. Such a closure would leave the 32-year-old mall without its only department store. However, this may not be such a bad thing as it could expedite pending redevelopment of the downtown block into a mixed-use project that will both complement and enhance the existing retail and commercial uses on State Street. HVM is another relatively tiny mall that could potentially be greatly impacted by Gottschalks' bankruptcy. A closure by Gottschalks here would leave the 29-year-old mall with two anchors (JCPenney and Sears). However, with the Hemet-San Jacinto area primed for future growth (and still relatively underserved retail-wise), it's doubtful an empty anchor would remain unused over the long haul. The center's biggest threat is likely to be any future large-scale retail development that may occur nearby in the coming years. With the fall of Mervyn's, which had been slated to fill the shuttered Broadway/Macy's, and the recent bankruptcy announcement by Gottschalks, this mall is probably the largest local mall potentially on shaky ground. The 43-year-old center could very well end the year with two of four anchor pads empty (leaving Macy's and Sears). However, with the all-but-final demise of nearby Carousel Mall nearly complete, coupled with potentially having two available department store pads, Inland Center could also have a slight advantage redevelopment-wise when the economy picks back up. Another small, non-traditional mall, The Promenade Shops in Corona could be the newest center that's struggling the most. Depending upon how the national retail landscape shakes out, the center's lack of large department stores could either hurt or help. In the short term, the 3-year-old center could very well see some store closings. However, its location within a high-growth and higher-end demographic corridor likely assures a future of some sort (though it could use help increasing its visibility). It also has that unique lake/bridge feature to boot. Even so, its biggest threat is the nearby Galleria at Tyler in Riverside, which includes a Nordstrom, Macy's and over 100 more stores than does Dos Lagos. Already impacted by last year's closure of its Gottschalks store (which remains empty), the Moreno Valley Mall could see significant impacts from any potential reorganization of General Growth Properties. The 17-year-old center was slated to receive a Steve & Barry's, until that company joined the ranks of shuttered retailers last fall. However, with three other anchors -- Macy's, JCPenney and Sears -- the mall, which has struggled in the past, remains relatively healthy. Likewise, future long-term growth to the east and south favor its survival. Another one-anchor mall that could be greatly impacted by any potential closure of Gottschalks is the venerable Riverside Plaza. As the region's oldest, large-scale shopping center, the 52-year-old, Victor Gruen Associates-designed Plaza has been performing well since its third incarnation opened in 2005 (which is less mall and more dining and entertainment). On one hand, a closure of Gottschalks would offer a unique opportunity for just the right anchor to step in and assume the 204,000 sq. ft., 4-level building (maybe an IKEA?). However, it could lead to the demolishing of the region's oldest, "modern" department store (and first, large-scale Harris' to be built beyond the flagship store in downtown San Bernardino). Yet, among the smaller malls of the region, Riverside Plaza is most likely to weather the turbulence. 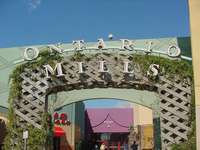 Though more outlet center than traditional mall, the gigantic Ontario Mills recently had its own brush with fate as the beleaguered Mills Corp was acquired by Simon Property Group in early 2007. It's difficult to say exactly how Ontario Mills will be affected by the retail downturn as its size -- and lower-grade store makeup -- is probably as much an asset as it is a liability. In some sense, the lack of traditional department store anchors might be beneficial. 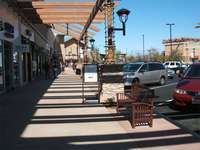 Likewise, the area surrounding the 13-year-old center has become a strong magnet for peripheral commercial uses, attracting everything from major big-box retailers and traditional strip centers to mid-range hotels. But this has led to unfriendly traffic levels (and very unfriendly pedestrian atmosphere) and possibly over-saturation. However, its location at the highly visible junction of the I-10 and I-15 likely assures its long-term future -- in one form or another. About the size of Corona's Promenade Shops but with the look of Victoria Gardens, The Shoppes at Chino Hills will likely weather the current retail turbulence. Its location adjacent to the city's new (and future) civic center coupled with the area's high-end demographics likely assures a future for the small, 1-year-old center. However, its lack of traditional department stores and insufficient parking could be a significant hindrance. 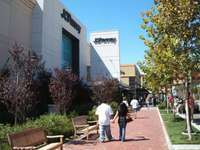 As such, the center's biggest threat is the nearby Montclair Plaza, which offers both a Nordstrom and Macy's (and many more stores). 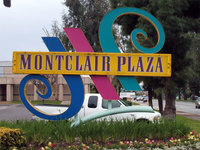 As one of the area's largest and oldest indoor malls, the Montclair Plaza recently underwent a moderate interior renovation. 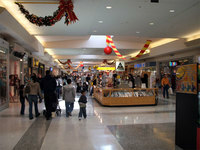 With anchors Nordstrom, Macy's, JCPenney and Sears, it has traditionally been one of the strongest malls in the region. Yet, the 41-year-old center does have an empty anchor (the former Broadway/Macy's) and could be impacted by any potential reorganization of its owner (General Growth Properties). It also faces stiff competition from newer, higher-end developments nearby (Shoppes at Chino Hills and Victoria Gardens). However, the mall is more than likely to weather anything excepting a major transformation of the retail landscape. With anchors Nordstrom, Macy's and JCPenney, the Galleria at Tyler is both one of the largest and strongest traditional malls in the region. Solidified by recent expansions that included AMC Theaters, Yard House, The Cheesecake Factory and PF Chang's, the 39-year-old center is likely to weather anything but a major retail shake up. Yet, it too is owned by General Growth Properties and also has an existing empty anchor (the former Broadway/Macy's). 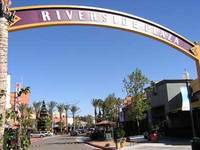 However, its freeway-adjacent location between higher-end demographics in both Riverside and Corona more than likely assures the center's long-term viability. 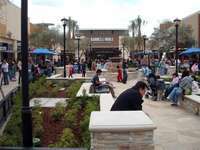 Probably the most insulated mall in the region, Temecula's Promenade stands on relatively solid ground. With four anchors -- Macy's-north, Macy's-south, JCPenney and Sears -- and few large-scale competitors nearby, the 10-year-old center dominates the southwestern Riverside County retail market. As with Montclair Plaza and Galleria at Tyler, the Promenade will withstand anything but a major retail shake up. And, along with Victoria Gardens, it will likely be in the running for the region's next Nordstrom. Probably the strongest and certainly the most unique mall in the region, Victoria Gardens is likely to weather most anything excepting a major transformation of the retail landscape. 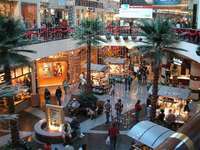 Its solid reputation, above-average store mix and pleasant outdoor atmosphere puts this center on relatively solid ground. It also contains the city's cultural center (with library and playhouse). The only foreseeable scenario potentially affecting the 5-year-old center would be the closing or consolidation of one or both Macy's anchors (one | two). 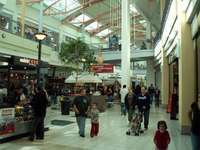 Such closures could potentially leave the 3-anchor mall with a single anchor (JCPenney). However, its highly likely a retailer the likes of Nordstrom would quickly snap up any empty anchor store.